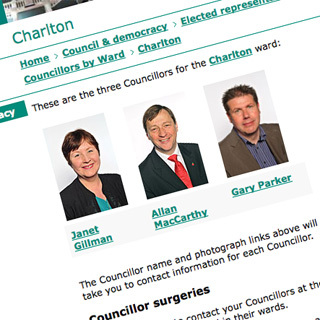 Here’s a date for your diary if you live in the central part of Charlton – 31 January at 7pm. That’s when there’s a “meet your councillors” event at the Charlton Liberal Club, held by the Charlton Central Residents Association. Charlton is unfortunate in that it’s divided into four different wards, Charlton, Kidbrooke with Hornfair, Peninsula and Woolwich Riverside, with the boundaries slicing right through some important areas (a stroll from Charlton post office to the Stone Lake retail park will take you through three of those wards). Do you hear from your councillors very often? I can’t say I ever hear from the Charlton trio outside of election time – which is why the “meet your councillors” event caught my attention. You may have had a different experience from me, mind. Peninsula ward’s Mary Mills is that rare thing, a blogging Greenwich councillor – see Mary’s Diary – and also sends out regular e-mails detailing what’s happening on her patch. But what about the other SE7 wards? I might well sneak along to hear what my councillors have to say. But I’d love to hear what your experiences have been with local councillors – have they been helpful or hopeless? If it’s the former, let’s celebrate it, and if it’s the latter – what can we do to improve matters? Next Article Have you seen Buster? A date with your councillors…. is there a by-election?! As you’ve already mentioned we’re spolit down here on the peninsula…we’ve got SuperMary™. I’ve heard there are regular meet and greets up at Charlton House on Friday evenings though. I could be mistaken however.